The news that exciting things are cooking among artists of faith in metro New York City should come as no surprise to fans of the eccentric Asthmatic Kitty record label, home to Sufjan Stevens and The Welcome Wagon. Further evidence comes in the form of Young Oceans, a worship collective formed out of the Trinity Grace Church, which has seven neighborhood churches in NYC, under the leadership of senior pastor and author Jon Tyson (Rumors of God). Young Oceans is a collection of original worship songs birthed from these gatherings, and as befits the progressive nature of the church, these tunes are atypical, atmospheric, and above all, authentic, ten deliberately understated songs with a deceptively passionate core. The common thread here is an unconventional approach to song structure coupled with rock-solid musicianship. The songs generally take shape in stages, working their way through several iterations, often with several minutes of instrumental riffing. Unlike Jesus Culture, which also features long, sprawling songs, Young Oceans places the focus on mood, not melody, although when the perceived spontaneity is peeled back, the result is a series of memorable, melodic worship songs. Such is “I Will Be Still,” a meditative, nine-minute piece with a grinding underbelly of electric guitars shaved whisper-thin to provide the mood underneath. About five minutes in, feedback fades into gently-strummed acoustic and cello for the song’s second section. “You Are Alive” flirts with a gospel feel on a gentle, mesmerizing chorus. “Great Is Our God” has a Eurythmics vibe, and “Hope of Glory” is perhaps the most enjoyable track on the album, with a bold chorus and smart transitions linked by the ambient sounds of everyday life (children playing, adults chatting) through the song’s lower-key moments. That these songs are able to maintain forward momentum despite their length is a true credit to the writing and playing. 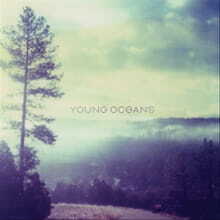 It makes Young Oceans a delightful discovery, hard to categorize, but easy to connect with. The arrangements are picture-perfect and harmonies spot-on. While this group has other aspirations than radio play or a recording career, the music fits as well in the foreground as it does providing background for personal worship or devotional time, and stands up as with the best of worship produced by and written for the Millennial Generation.